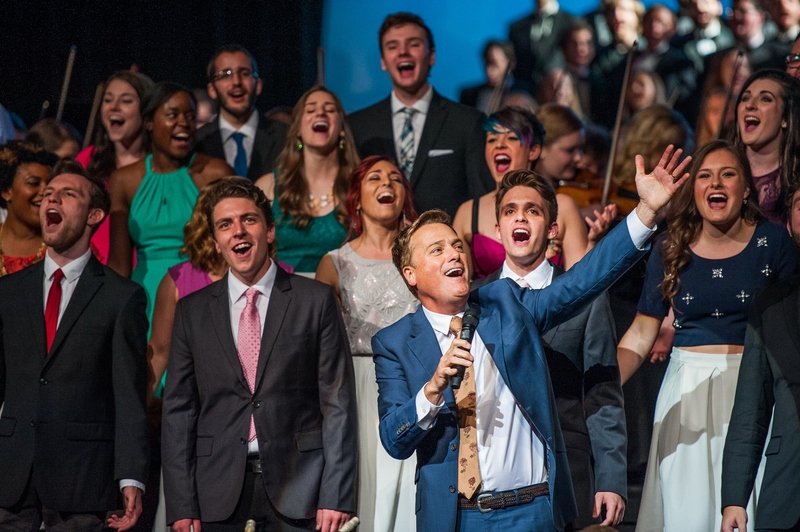 Belmont University’s School of Music honored acclaimed singer/songwriter/musician Michael W. Smith with the Applause Award at Saturday night’s annual President’s Concert. The Applause Award is the most distinguished award presented by Belmont’s College of Visual and Performing Arts and is given annually to honor those who have made significant contributions to the arts. On National Philanthropy Day in 2014, the Nashville Chapter of the Association of Fundraising Professionals named Smith the Philanthropist of the Year, based on his extensive work with Rocketown, which he founded in 1994. Rocketown, the first of its kind in the Southeast, has grown into a model example for Christian-based relational outreach programs across the country. The current facility touts three stages for live entertainment, in addition to Middle Tennessee’s only indoor skatepark and a recording studio, as well as photography, art and dance studios. More than 800 teens from across the region participate in Rocketown programs each week. Smith has also been actively involved in volunteer service and is the former vice chair of the President’s Council on Service and Civic Participation. He is an avid spokesperson for sponsoring children through Compassion International and also serves on the Belmont University Board of Trustees. Previous Applause Award honorees include the Grand Ole Opry, Eddy Arnold, Chet Atkins, The Beaman Family Foundation, Vince Gill and Amy Grant, Donna Hilley, Ronn Huff, Martha Ingram, Nashville Ballet, Nashville Opera, Nashville Symphony, Barbara Massey Rogers, Kenneth Schermerhorn, Ricky Skaggs, Tennessee Repertory Theatre, Jerry Warren, Sam Wilson and CeCe Winans.